Are Grad Students Employees? Labor Board To Again Weigh In : NPR Ed It's a labor issue familiar to regulators. For decades, the National Labor Relations Board held that students were not employees, then ruled in favor of students in 2000, then reversed again in 2004. 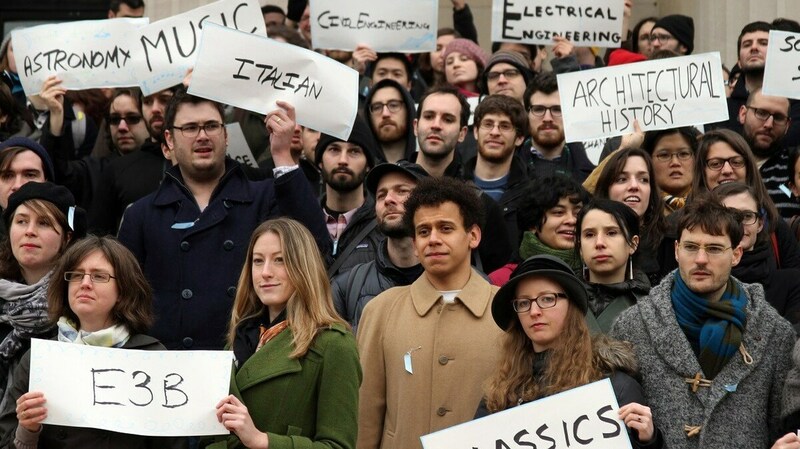 Graduate workers rally in 2014 at Columbia University for the ability to unionize. Graduate students at private universities are asking regulators to consider these questions: Are we employees, or not? Can we join a union? The National Labor Relations Board recently decided to review its previous position, reigniting debate within the ivory tower. For Paul Katz, who's three years into a history Ph.D. program at Columbia University, the 15 to 20 hours a week he spends teaching university undergraduates should mean he's an employee. He teaches in addition to conducting his own research. "I grade all of their papers, their exams, I run review sessions, I meet with them one-on-one, basically support them throughout the semester," Katz says. "The university should treat me as an employee because I do work for them." But technically, he doesn't. The university classifies him as a student — even though it pays him a stipend and provides health insurance. "It's more or less impossible to live in New York City on a graduate stipend and not spend at least 40 percent of your income in rent," he says. You must be considered an employee to form a union, so it's hard for Katz and his fellow graduate students to do much about their status. There are 1.7 million graduate students in the U.S, according to the Council of Graduate Schools. A small fraction — about 2 percent — are represented by unions, nearly all of them at public universities, which are governed by state, instead of federal, labor laws. With respect to private universities, the National Labor Relations Board has flip-flopped in its policy. For decades, it held that students were not employees, then ruled in favor of students in a case in 2000. Under a new administration, the board reversed itself again four years later. Now, students at Columbia and The New School are petitioning for another change. John Logan, a labor and employment professor at San Francisco State University, says the shifts are tied largely to the political makeup of the board. "When we get a new administration and the composition of the board changes, then sometimes you get this process of policy oscillation where the pendulum swings from one side to the other," Logan says. Meanwhile, he says, grad students' interest in unionization continues to grow. Aaron Nisenson, counsel at the American Association of University Professors (which has an affiliated union), argues that unions in higher education are increasingly necessary, as universities — like private corporations — rely more on cheaper labor. "Everybody starting in a professional career can get some experience at a new job, but that doesn't make it not a job," Nisenson says. "Universities more broadly have been pushing a lot of the work towards contingent faculty, towards graduate assistants and towards other non-tenure track faculty." In an emailed statement, Columbia University spokesman Caroline Adelman says teaching and research are part of postdoctoral training. She says students' relationships with their mentors are "unlike typical employer-employee relationships and not well served by a one-size-fits-all collective bargaining process." Peter McDonough, general counsel of the American Council on Education, agrees. His group represents university leadership. "Graduate students are students — students first," he says. McDonough says research universities in particular give their faculty wide latitude in setting up grad student work hours and schedules. He says losing that flexibility might jeopardize some kinds of research. He also says the process has become very politicized, and current labor board members are reconsidering this issue for political, instead of policy reasons. Even if his side loses this decision, he says, it could always change back when the composition of the labor board changes again. "I have real doubts that it would be a sustaining view," McDonough says. The NLRB has not said when it might issue a decision.